Winter CAN be fun…holidays, spending time with family and friends, big meals, parties, gifts, decorations…and, depending on where you live, snow, sledding, skiing, snowboarding, and lots more! BUT winter can also be rough (depending on where you live). It can be really cold, lots of snow and ice, shoveling, difficult driving, dangerous roads, high power bills, etc. What irks you most about winter? Well, I’ll tell you what I hate the most about winter…getting sick…the FLU or a COLD. Missing work, laying around feeling miserable with no energy, getting others in my family sick (OR getting sick because they’re sick! ), passing colds around the house, etc. We’ve all been there – stuffy nose, chest congestion, headaches, nausea – all the side effects of the cold and flu viruses that run rampant this time of year. You remember the misery that hit you sometime around January, don’t you, when you were hunkered on the couch with a blanket and a box of tissues, watching countless Walking Dead reruns? Don’t you wish you knew better ways to fight those nasty bugs than just getting a vaccine that may or may not work? Aside from putting yourself or your children in quarantine and not touching anything ever, both of which are basically impossible, you CAN reduce your risk of contracting an illness this winter. Eating the right foods to strengthen your immune system and lower inflammation can greatly improve your chances of staying germ-free during the winter (or anytime). READ ON to find out what these foods are and how to include them in your diet. Did you know that 80% of your body’s immune tissue dwells in the intestinal tract? Areas called Peyer’s Patches, located in the small intestine, are responsible for producing the body’s immune tissues and building up antigens (molecules that attack diseases and other invaders). Peyer’s patches also help regulate the populations of gut flora, or the bacteria that live in the digestive tract, by keeping the balance between the helpful bacteria and those that can cause sickness. There are billions of bacteria in the body, all of which play important roles. Those that live in the gut are no exception. These organisms, also called commensal flora or probiotics, do everything from helping with waste elimination (yes, poop) to releasing anti-inflammatory compounds. They also keep the intestinal contents from leaking out, and they even eat the bad bacteria! Without the proper balance of these good guys, along with a poor environment for them to grow and thrive, a host of health problems can arise. Inflammation, which can occur simply from everyday stress (but also poor dietary habits), releases hormones that suppress the immune system and prevent your body from using nutrients properly (Wu and Wu, 2012). When a person’s diet is not up to par, the flora do not have a good environment in which to live. If your house was filthy and all your food was rotten, would you be happy? Same rule applies here. Since these bacteria eat the byproducts of what you eat, they cannot be healthy if your diet isn’t. This brings to mind the term symbiosis – where two organisms work together to create benefits for both of them. We give the bacteria the food they need, and in turn, they protect us! There’s a great deal of research on the connections between diet, gut health, and disease. Among the health conditions implicated in poor gut health are obesity, diabetes, and autoimmune diseases like rheumatoid arthritis and Crohn’s disease. There’s even a theory that behavioral disorders like ADHD are linked to the “leaky gut” that can arise from gut flora imbalance (Wu and Wu, 2012). There are a number of foods you can eat to help maintain gut health, strengthen your immune system, and reduce inflammation. The good news is that you don’t need any fancy, expensive designer foods — these are all whole foods that can be purchased at any grocery store! This makes feeding your family healthy food very convenient and simple. Try to eat at least ONE serving of each of these foods DAILY for maximum benefits. These are foods that actually contain living, active cultures of the same beneficial bacteria that live in your digestive tract. Examples include yogurt (don’t worry if you’re lactose-intolerant; there are dairy-free versions, too! ), kefir (a liquid version of yogurt) dill pickles, tempeh, sauerkraut, miso soup, soft cheeses like brie, kimchi, and kombucha (a popular tea drink that you can brew yourself or buy in bottles in the produce section). These foods should be eaten to help provide a rich environment inside your body for the probiotic organisms to grow. These include garlic, onions, asparagus, bananas, and wheat bran. Also, foods containing prebiotics also generally provide probiotics. Fiber assists the gut flora with keeping food waste moving smoothly through the digestive tract. A diet low in fiber can not only cause constipation, but also lead to disorders like diverticulitis and irritable bowel syndrome. Virtually all fruits and vegetables, as well as oats and other whole grains, contain dietary fiber, and 25-40 grams per day is recommended. The main nutrient responsible for protecting the immune system is zinc. The best sources are beans, oats, oysters, chicken, turkey, crab meat, and nuts. Other foods great for boosting immunity are garlic, onions, mushrooms, and raw honey (National Institutes of Health, 2016). Omega-3 fatty acids are a key nutrient in keeping inflammation down. Good sources are salmon, tuna, walnuts, flaxseed, hemp seeds, and olive oil. Leafy greens, berries, turmeric (the yellow spice found in curry powder), and green tea also have powerful anti-inflammatory properties. Lunch – Grilled chicken over a large salad with onions, tomatoes, cucumbers, mushrooms, and a balsamic/olive oil dressing. Furthermore, supplementing your meals with good probiotic supplement is an extra layer of protection this winter. When your immune system is weakened, it’s like you’re opening the door for invading bacteria, viruses, and toxins. Not only that, but you’re going to feel run down, tired, and weak. Perfect Biotics has been designed to ensure that you maintain the ideal ratio of 85% good bacteria and 15% bad bacteria in your gut so that your immune system is running at top speed. As you’ve just read, protecting yourself and your loved ones against the cold and flu this winter can be as simple as making just a few dietary changes and taking a good probiotic. A healthy family means fewer sick days missed from school and work, fewer missed holiday gatherings, and a happy home! Here’s to a happy winter! Jean Maxwell is the owner of MaxWell Nutrition, LLC, a nutrition consulting company. She received her Master’s Degree in Nutrition from East Carolina University in 2007 and has been a dietitian for 10 years. Additionally, Jean has been a vegetarian for nearly 20 years and loves making vegetarian dishes for friends and family to show them how delicious it can be! She has a particular interest in gut health because she was diagnosed with Irritable Bowel Syndrome (IBS) as an adolescent, which led her to improve her diet to better control the condition, and she was amazed at how simple it was! This was also a major reason that she become a dietitian – she wanted to help others live better by improving their nutrition. 1) Wu, E., and Wu, HJ (2012). The role of microbiota in immune homeostasis and autoimmunity. Gut Microbes 3 (1): 4-14. Looking to detox and lose weight? Or maybe you just want to give your body a healthy cleanse? Fruit infused detox water is great to bring along with you and sip all day as a delicious hydrating treat. Let’s take a look at some tasty recipes that your body will love. Summer is for laying in the sun, splashing around in the pool, and indulging in cool treats. While the hot weather can definitely be enjoyable, it’s also a time many people overindulge in hard-to-digest milkshakes and other unhealthy snacks. 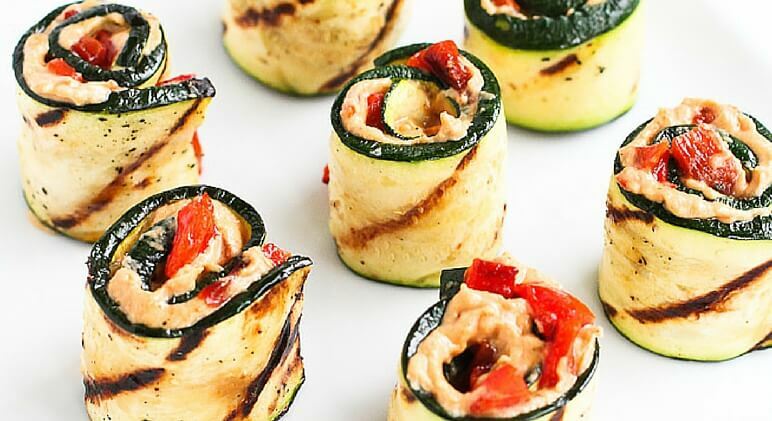 To help you stay on track with your clean eating habits this year here are 8 healthy summer snacks that are not only delicious but also nutritious. This all-natural avocado hummus is way healthier than the store bought stuff and it’s super easy to make. If you’re looking for a snack filled with healthy fats and protein then this is a great one. Get the recipe here! Nothing says summer like throwing some veggies on the grill! Something about grilling vegetables really brings out their flavor. 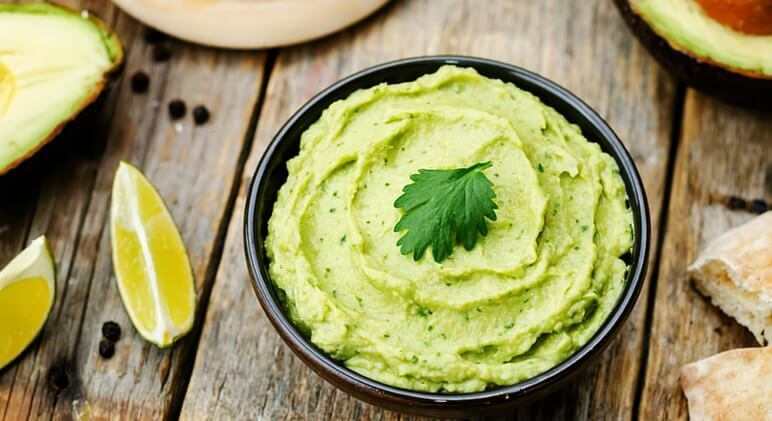 If you don’t like hummus, you can always swap it out for mashed avocado. Get the recipe here. 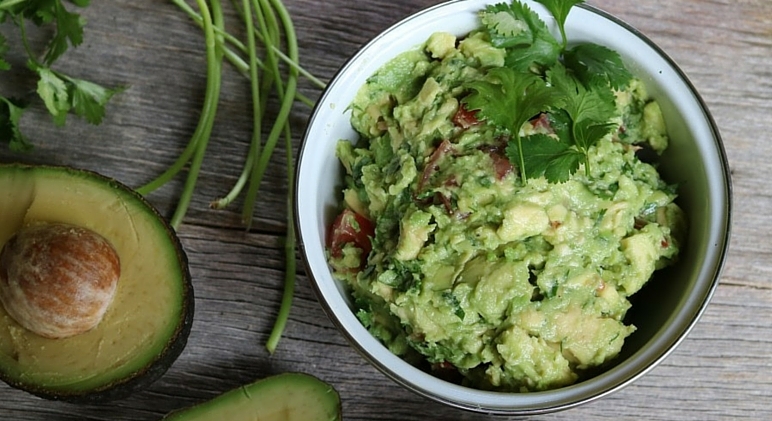 Guacamole is another great summer dip and it’s so easy to make at home. Instead of chips, dunk carrots or other veggies in this healthy guacamole. See the full recipe here. 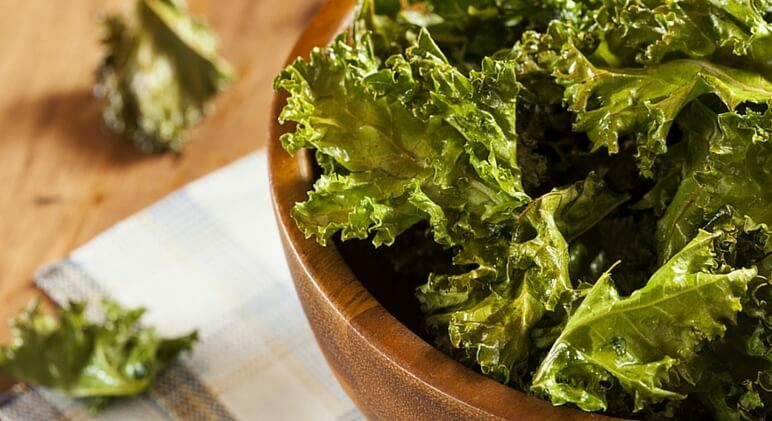 Crush your crunch cravings with kale chips! If you have a dehydrator then check out this great recipe. If not, you can make them in the oven by following this recipe! 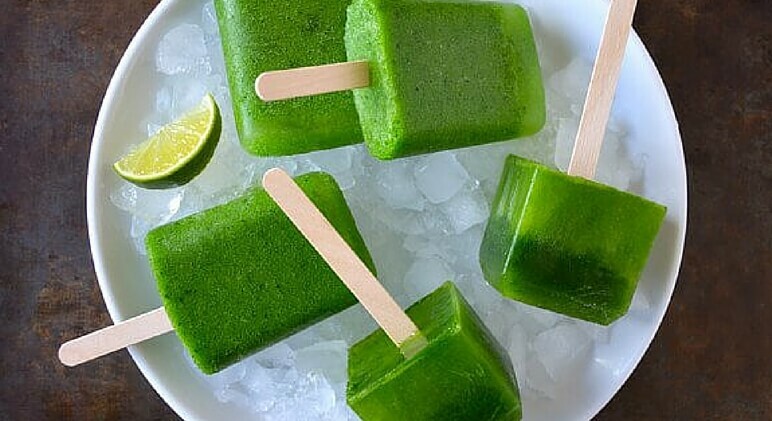 Turn your morning cup of green juice into a refreshing popsicle. If you already juice, you can simply put your own blend into popsicle molds and put them into the freezer. Or, check out this recipe! 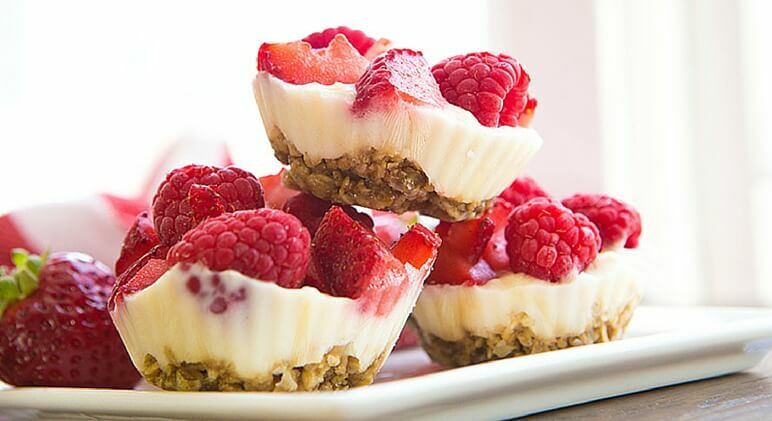 These frozen yogurt “muffins” are great for breakfast or an on-the-go snack. They’re filled with probiotics and protein! Plus, the fruits provide a nice dose of antioxidants. Get the full recipe here. Grab some fresh blueberries, dip them in yogurt, and pop them in the freezer! 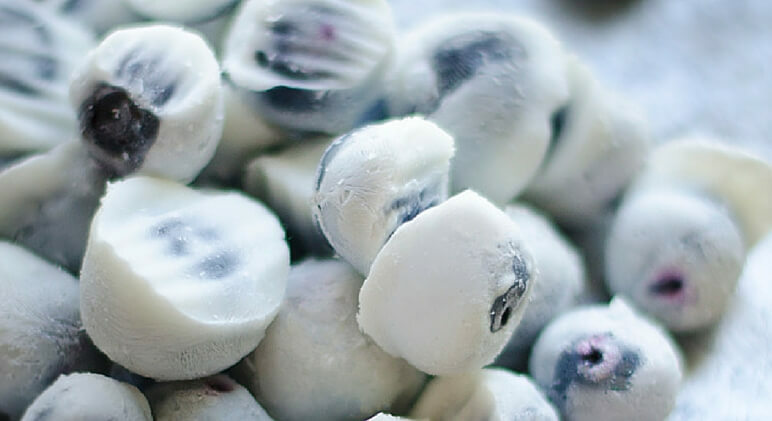 These frozen blueberry bites are refreshing and loaded with vitamins, minerals, and antioxidants. It doesn’t get much easier than this. Line a baking sheet with parchment paper, spread an even layer of yogurt, and sprinkle some fresh fruit on top! 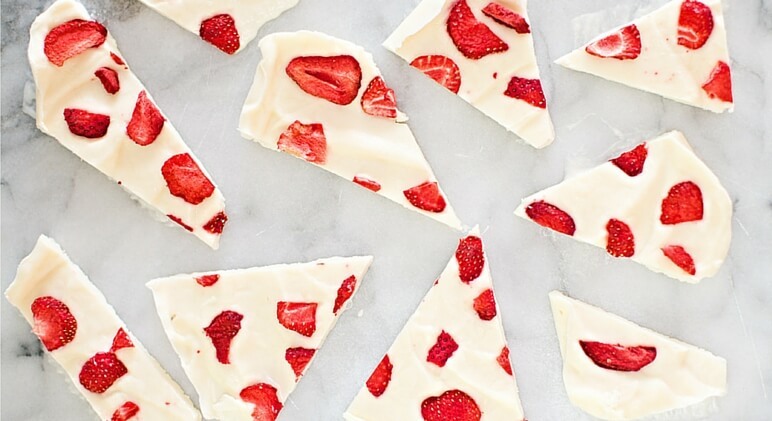 Pop it in the freezer overnight and enjoy your yogurt bark the next morning! Irritable Bowel Syndrome (IBS) is a disorder that affects between 25-45 million Americans. Some common symptoms of IBS include stomach cramps, gas, bloating, constipation, and diarrhea. Adding ginger to your diet can help relieve these symptoms because the spice can actually relax your intestines during flair ups. Not only will this ease symptoms, it will protect against further damage to the intestinal tract. While gas is a symptom of IBS, we thought it deserved its own spot on the list. Doctors say drinking a cup of ginger tea before bed or prior to eating meals can help clear out the digestive system and relieve embarrassing gas. 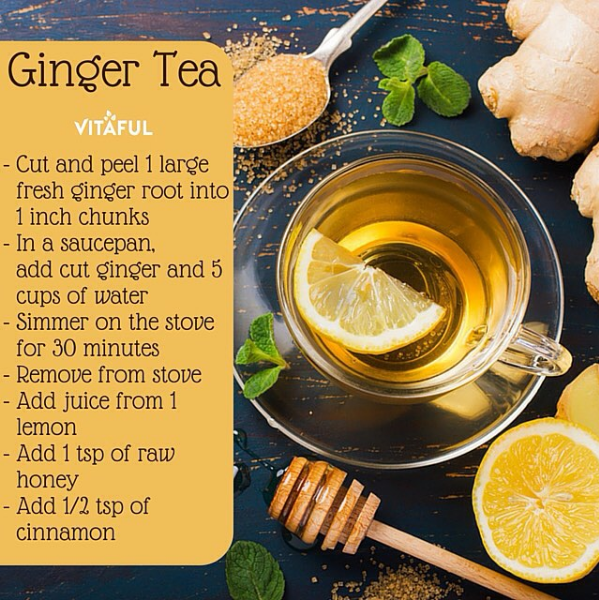 *See our ginger tea recipe below! 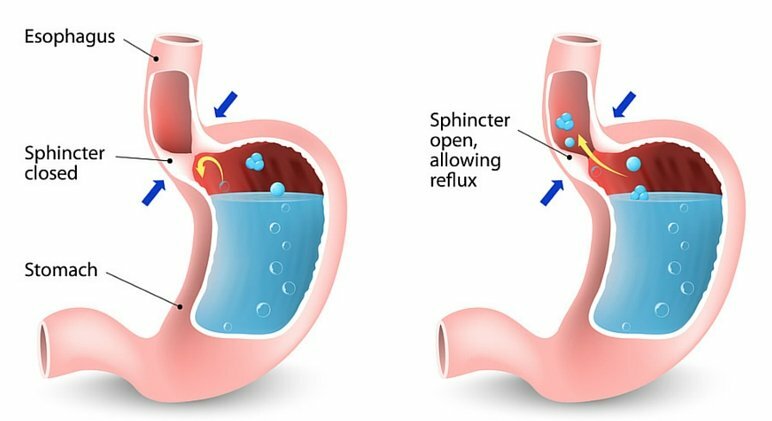 Heartburn is the main symptom of acid reflux. If you’ve ever experienced it before, then you know how painful it can be. Ginger has been proven to protect against heartburn because it prevents the lower esophageal sphincter (LES) from loosening, which means acid cannot regurgitate back into the esophagus. Additionally, ginger can kill harmful bacteria that is linked to acid reflux. Have you ever heard the popular saying, “You are what you eat?” Well, that isn’t entirely true. Instead, people should really say, “You are what you absorb.” You may not even realize it, but when you eat a nutritious meal, often times your body doesn’t absorb all of the beneficial vitamins and minerals. In fact, people typically absorb anywhere from 10-90 percent of the nutrients in their food. Some foods have been shown to boost nutrient absorption and ginger is one of them! Add ginger to your meals or drink ginger tea before meals to help your body absorb more nutrients. If you are someone who gets sick when riding in a car, bus, or plane, try drinking some ginger tea before traveling. Researchers say ginger has powerful healing effects that can settle an upset stomach. Everyone could benefit from going gluten-free… hands down. 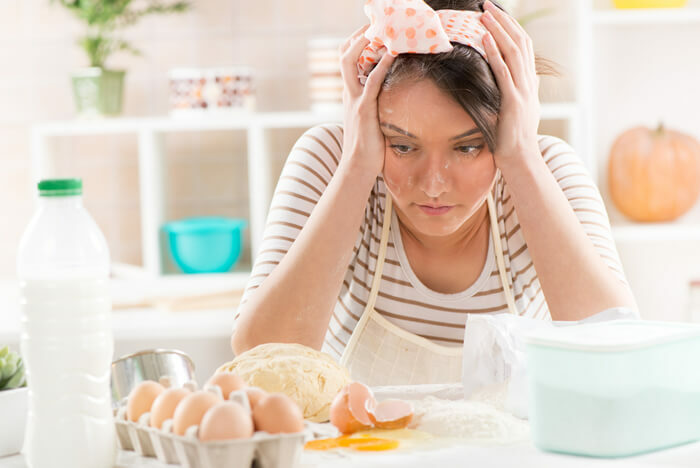 Whether you’re gluten intolerant, need to heal a damaged digestive tract, looking to lose weight or simply want to improve your overall health, ditching gluten can help. Gluten is a protein found in wheat, rye and barley. People who are gluten intolerant, or suffer from Celiac Disease, have trouble digesting gluten. Their bodies perceive gluten as an invader and triggers an immune response that damages the intestines. You may be thinking to yourself, “Can I eat any baked goods while eating gluten-free?” The answer is YES! One of the most important steps is to swap out white and wheat flours, which are HORRIBLE for you! 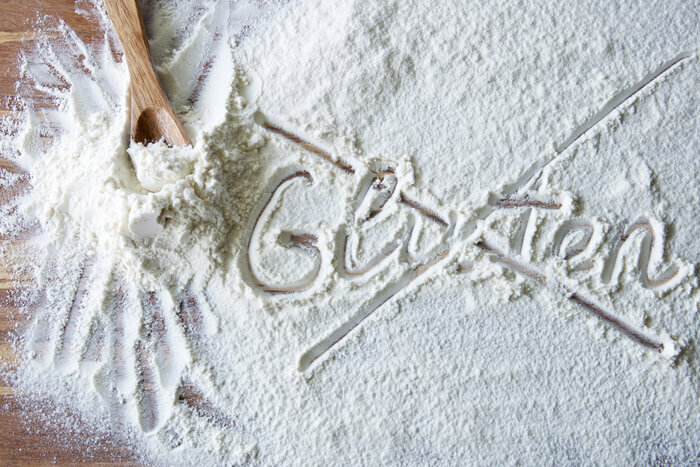 Most white and wheat flours contain gluten, are bleached and hard on your digestive system. This popular gluten-free flour alternative has people going coco-nuts! It’s high in fiber, low in carbs and chock-full of protein. Among it’s many health benefits, coconut flour is actually great for digestion. You cannot substitute coconut flour with wheat or white flours at a 1:1 ratio. They are not equivalent. Rather, in baked goods, you typically want to use 1/4 cup coconut flour for every 1 full cup grain flour. Since coconut flour is clumpy, it must be thoroughly beaten. Coconut flour has an irresistible sweetness to it, so you may want to cut back on your sweeteners. Almond flour has all the same health benefits as a handful of almonds! It’s great for making baked goods such as cookies, cakes and pastries. It’s also good for coating foods like chicken tenders. Depending on the brand, you can get “fine ground” or a more “coarse ground”. Using a coarser ground almond flour could make your baked goods overly grainy. Once opened, store almond flour in the refrigerator or freezer. This will prevent spoilage. When baking pastries, cakes, cookies, pancakes or breads, you can replace a portion of your flour with hazelnut flour. This will add key vitamins and nutrients to your pastries, along with reducing the carbs! Try replacing 30% of your flour with hazelnut flour. Chia seeds may be small, but they pack a powerful nutritional punch. They’re rich in protein, Omega-3 fatty acids and antioxidants. They also contain numerous vitamins and minerals important for your overall health. Chia seeds are known to boost energy, fight inflammation, support heart health and lower blood pressure (just to name a few benefits). Chia seed flour feeds the body those same benefits, since it’s simply made of ground chia seeds. You can make your own chia seed flour by putting seeds into a coffee grinder or blender and pulsing until they’re finely ground. Be sure to store your chia seed flour in an airtight container. You can use chia seed flour in a wide variety of gluten-free recipes as a 1:1 replacement for wheat flours. This is one of the most nutritious flours out there! You can use quinoa to boost the protein value of your baked goods since it’s a wonderful source of complete protein, providing all of the essential amino acids. As far as flavor, quinoa flour will add a light, nutty flavor to your baked goods. You can replace up to 1/4 of wheat flour with brown rice flour. Since rice flour absorbs more liquid than wheat flours, you may need to add more eggs and/or liquids. 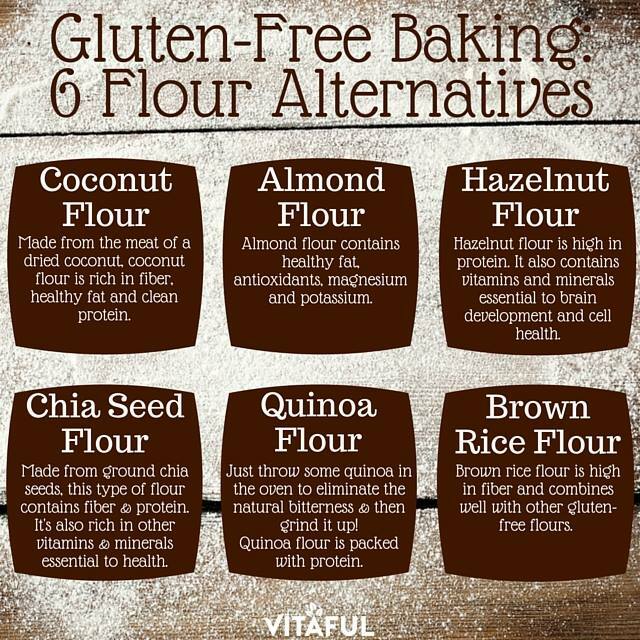 When switching from traditional all-purpose flour to any of these gluten-free flour alternatives, expect to go through a trial and error period! Remember, these flours act very differently than traditional all-purpose flour. For this reason, we recommend looking for gluten-free recipes that already call for these flours to make things easier on yourself.